At LCSWMA we work together to protect our future and community. We provide incredible opportunities for personal and professional growth. We take pride in caring for our employees and their families. We make great things happen! At the heart of LCSWMA is a dedicated team of industry professionals with a known reputation for EXCELLENCE. Our employees are guided by our MISSION to manage waste as a resource to protect and benefit our community. We have created a culture of empowered employees who deeply VALUE a safe, well and happy environment. #LCSWMALife – Culture is something you feel. Indirectly, it’s something you see in our welcoming environment. From the moment you step onto our property, you’ll know. This is where you belong. LCSWMA leadership is committed to the internal environment of employees by creating a culture of inclusivity and COLLABORATION. Our employees work together to turn waste into a resource to benefit our community. Good COMMUNICATION is an integral element to our success and fosters TRUST. LCSWMA employees are productive and operate effectively because leadership is committed to providing feedback and cultivating ideas. INNOVATION is embraced throughout our organization using experience to enhance performance with on-the-job training. Our teams are cross-functional and combine strengths of each employee. LCSWMA has created a SUPPORTIVE team environment where employees can excel and GROW. BALANCE is important to us too! We offer a comprehensive benefits package, provide volunteer opportunities and sponsor several community events. We celebrate success! Be part of an industry leader. 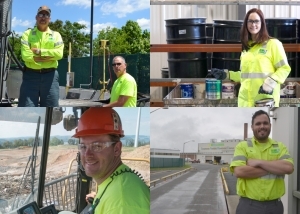 Our employees enjoy working on a team that is dedicated to nationally-recognized excellence in the waste industry for our integrated system. 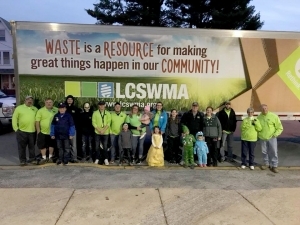 The Facility Manager, Frey Farm Landfill, is responsible for the daily operation of the LCSWMA Frey Farm and Creswell Landfills within all regulatory guidelines and requirements, and LCSWMA Policies and procedures in line with the strategic objectives of LCSWMA. Responsible for the safe operation of all LCSWMA Heavy Equipment. Dispose of waste and place daily and intermediate cover using approved methods, while encountering various conditions from the weather. Along with the Environmental Compliance Manager, assist with LCSWMA’s ISO 14001 Environmental Management System, environmental reporting and documentation, as well as LCSWMA’s Sustainability Plan and alternative energy and other special projects. Repair and diagnosis of major components or remove/replace major components of various truck and trailer equipment at the direction of the Equipment and Maintenance Manager. Expectations include the ability to diagnose and repair the following with little or no supervision: clutches, PTO systems, electric systems, hydraulic/air brake systems, heating/air conditioning systems, instruments and gauges, and preventative maintenance service. The Senior Accountant provides critical support and back up to the accounting team with respect to financial reporting, internal control maintenance, interaction with outside auditors, financial analysis, capital planning, cash management, revenue recognition, process improvements, various accruals and other such activities as provided by the Controller in order to provide information about LCSWMA’s performance to internal and external stakeholders such as business partners, creditors, tax authorities, customers, vendors and others. LCSWMA is committed to fostering, cultivating and preserving a culture of diversity and inclusion. Our human capital is the most valuable asset we have. We embrace and encourage our employees’ differences in age, color, disability, ethnicity, family or marital status, gender identity or expression, language, national origin, physical and mental ability, political affiliation, race, religion, sexual orientation, socio-economic status, veteran status, and other characteristics that make our employees unique. LCSWMA believes that attracting and retaining a base of employees who reflect the diversity of the local community is an important part to our continued success as an organization and as a community partner. Read our Diversity Plan to learn more.